A similar thing must happen with music. Children are brought up these days hearing music of all kinds on the radio and on television and on their iPods and tablets. Although a lot of music is very simplistic and boring, there's also a high level of complex music even in things like television adverts, so their brains will be adjusting to this sort of thing from a very early age. The Mozart quartets, when they were written, would probably have sounded strange to most people just as the Bela Bartok quartets are unfathamable to most people today, as are the even stranger sounds created by some of the present day string Quartet composers. But even these will become normal to the year because of the training in these kinds of harmonies and seemingly discordant melodies that one gets from the film industry. Much of film music isn't noticed by the viewers, but if you listen to it carefully, particularly in suspense movies and thrillers, you're listening to advanced music and harmonies that people can accept when they're having a visual stimulus of the film and are absorbed by the emotions created by that film, but would find totally unacceptable if they were listening to it at their 40th birthday party or their wedding breakfast. Something of this nature must have happened over time with the Haydn and Mozart string quartets that are so acceptable today. Furthermore, life in many ways is becoming more complex and multitasking. Children can play video games and watch pop videos that move and multitasking to speed that the older generation just cannot cope with. So the human brain is adapting to complexity. Whether this is a learning process or actually evolution taking place is difficult to say. Although it would seem doubtful that it is a genetic change because of the rate of development, it could possibly be an epigenetic variance together with the early learning experiences that is allowing such a change in human mental capabilities. So in the early days, when such complexity could not be handled by the average population of that day, the solution to being able to understand the string quartet was to write it in the form of a fugue or Canon. But then along came Beethoven with a great few of the big B-flat quartet, Opus 130, for which back in 1826 he was persuaded to provide a lighter substitute to please his publisher. Composers don't work in isolation though, they work with the musicians and the instruments of the time, and as string Quartet compositions developed, in parallel the techniques of the string players progressed. Vibrato was developed to give a richer, fuller and more passionate sound, (often relevant for wedding music, particularly for the recession). Techniques of playing in higher positions were developed by violin virtuosi and taken on board by the musicians of the string quartet. For example the first violin, particular playing Brahms, Elgar or Revell string Quartets, has to play much higher on his instrument than would the first violin of the quartets who played the first Haydn and Mozart string quartets. They would probably have been totally mystified by the more recent music. The string quartet had developed a style of his very own, being such a compact and lasting form. This is so in two senses. Firstly there is the musical style, which could be regarded as whatever it is that governs the composition of the music and runs through all of the structural elements of that music, something would one could consider as the "inner bearing" of the quartet. This combines the composer's musical concepts with perfection of technical elements to achieve a full crystallisation of the music. As the string quartet is much purer than the sound of a full symphony orchestra, with its limited colour palette and the possibility of only four parts, the composition for it becomes more dependent on the intrinsic musical ideas with the notes themselves taking on more individual significance. Perhaps this is why the early quartets comprising wind and brass instruments were replaced by the string quartet with a greater variety of colour and subtlety that can be achieved with a string instrument. In the early days this would not have been true, as the instruments themselves and the technique of playing the man not developed to allow the full emotional capability of stringed instruments to be achieved. But I would say (of course I would, I am a string player, but I always tell the truth! 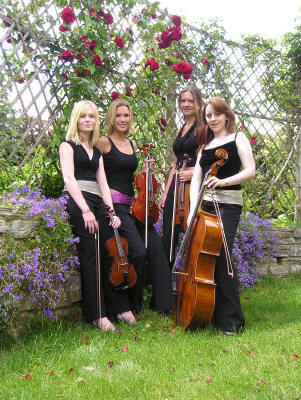 ), I would say that nothing can surpass the string quartet in the range of emotions that can that it can achieve. This is one reason why a string quartet is so popular regimental banquets, church wedding ceremonies and wedding breakfasts. Another consideration is that it might be rather difficult to pack a hundred piece symphony orchestra into your local village church and still expect to get the wedding guests in their as well. Another consideration could well be that a string quartet is very cheap compared with a full symphony orchestra for a day, but hey ho what is money? So much for composing a string quartet, what about the performers? Without the performance the string quartet does not exist in the interpretation of the music and personality of the players is also significant. I intentionally say personality, because a string quartet performance is such an intimate event that how they interact with each other and sometimes the audience, can have a significant effect on the ultimate outcome. So the style of the string quartet performers is important but has to be blended with the style of the music. There are traditional styles for each composer, accepted styles and deviation too far from these would seem odd to a listener but may or may not make rubbish of the music itself. If one listens to old recordings of Russian symphony orchestras for example, the brass section play with slow and wide vibrato. This sounds strange today to most people’s ears, we have vibrato is very limited or sometimes totally absent from brass playing of the same piece of music. The same applies to string quartet styles. Listening to some old recordings of famous string quartets the music and sound crude to our ears, but is it really? Music colleges these days seem to focus on technique, silky smooth sound, delicate playing, but what about passion and emotions like that. Sometimes I think that the teachers don’t have such emotions. These can be evident in some old recordings. And what should the style of piece of music be in any case. Again moving away from the string quartet, I remember going to performance of Vivaldi’s music recorder ensemble. The concert was given in Venice. Vivaldi is we know it today is very precise and rhythmical. Even if you listen to exciting performances like the ones given by the great violinist Nigel Kennedy, the pulse is very accurate even though he does pull things around with in a bar on occasions. Anyway, the leader of this recorder ensemble explained that they were going to play the Vivaldi in the style that would have been played at the time. There was a long dissertation about how they knew the style was I’d guessed what the style was, of that time, to lend some credence to it.